Let’s talk cleansing. But first, let it just be said that doing a New Year’s Cleanse without a daily digestive follow-up routine is like having your HVAC vents and ducts professionally cleaned, without running a good air purifier daily afterwards. Duct cleaning + no air purifier = a waste. You gotta actually deal with the daily flow of stuff that gunked up your ducts (or digestive system) in the first place. Otherwise, those vents will end up looking like ours here… just 2 years after a clean sweep, we’re back to the dusty drawing board again. Same goes for a New Year’s “cleanse” without any daily-gut-purifying. That’s why, my #1 Resolution was covering my bases daily with probiotics, enzymes and DiGize! But with that pro-health routine in place, I wanted to do a deep, digestive system cleanse to weaken and remove the “bad guys” in my gut, giving my body and brain a concentrated dose of nutrients as I did it. Cleansing - is it all Hype? C. Involve some healthy dose of nutrition, but no potent, bad-guy-killing, toxin-clearing plan. Part 2: Targeted focus on your health needs with supplements/oils (whether it’s liver detoxing, weight loss, or parasite/candida/bacteria cleansing). Placing your “targeted focus” within your “concentrated nutrition/liquid fast” will ensure the maximum benefit for your efforts. This Suja Three Day Fresh Start is my #1, and these Young Living supplements are my #2: ICP, ParaFree, ComforTone for parasite/candida/bacteria cleansing. Why Start off A Health Goal with a Juice Cleanse? First off - giving your body a break from digesting normal food is good. Digesting food takes a ton of energy. Plus, your cells and GI system will benefit immensely by this concentrated nutrition from raw, organic juices. Fasting and raw juicing is an integral part of groundbreaking protocols that many cancer survivors attribute to their drug-free, total recovery. Why do juicing + these supplements together? You want to do a liquid cleanse WHILE focusing on a target goal because carbs, sugar, bad fats, meat, alcohol, dairy…all these things can be damaging your liver, making you gain weight, and feeding those parasites and candida. Whatever your health goal is, “eating normally” typically just doesn’t help it. Starve the bad guys…then while they’re weak, knock them out while boosting your body! Basically - you want to do a “One-Two Punch”. You wanna take a few days and stop putting in the “meh” food that’s hurting your goal (and do a liquid cleanse instead) WHILE packing in the good stuff (nutrition + potent, targeted, goal-oriented supplements). I ABSOLUTELY LOVE this cleanse! (And no, I’m not getting paid to say I love it ;) My hubs and I did it last year in January, and we’ve done it again this year. But get yours quick … it’s seasonal for all the post-holiday New Year’s detoxing, and last year they were gone by February 1! When you’re doing a fast/cleanse/detox, you need concentrated nutrition…and unless you’re on vacation or taking PTO, juicing your own juices is probably a little too much to ask. Costco has made this so easy. Don’t tell yourself “doing a cleanse is too involved.” Not with this set! They’ve taken the guesswork, shopping list, and label-checking out of the process. So you can just do it! Price-wise, at $18, this box is way cheaper than buying 3 days worth of juicing fruits and vegetables, or 9 fresh-pressed, ORGANIC juices or smoothies at your local coffee shop/juice bar (like $9 each)! New to cleansing? Not sure if you can do 3 days with no food? No problem!! They’ve included a mini-meal plan with 9 delicious, simple, guilt-free foods specially chosen so they won’t hinder your detox program. They even included recipes and a grocery list. They’ve got you covered! If you’re doing a cleanse, you will NEED to either these clean-eating mini meals, OR take a supplement like ComforTone (what I show in my pictures) or an herbal laxative tea while cleansing. What makes for a good liquids cleanse? This cleanse meets all those criteria. And …its designed very intentionally for maximum effects. What’s the Suja Juice Cleanse Program? AM - this drink is based on the infamous “Master Cleanse Lemonade” elixir that is deeply detoxing. It also contains probiotics for some extra TLC for your gut! NOON - a strawberry-banana vegetarian protein smoothie. PM - a green juice chock full of cell-nourishing, living nutrients, antioxidants, vitamins, minerals, and enzymes… with Garcinia Cambogia to rev up your metabolism and aid in weight loss. Like I said - this one was only at Costco for the month of January last year. 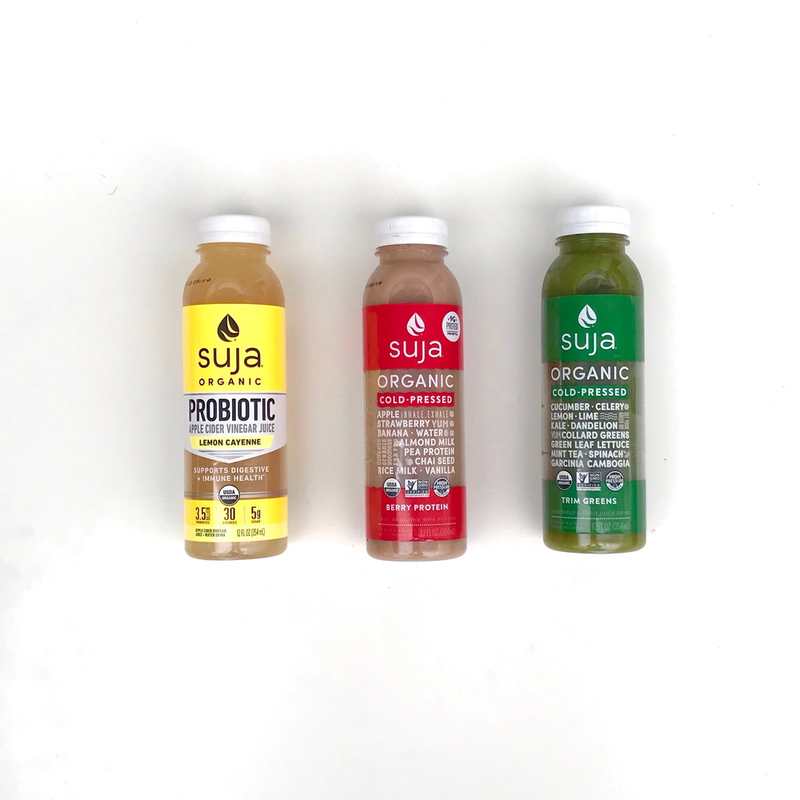 If you miss it, then grab Suja’s “Daily Greens” 9-pack of juices instead. No Costco card? Buy low-sugar, green juices elsewhere for your nutrients. Young Living’s protein shake in the Slique Advanced kit if you’re focusing on weight-loss. 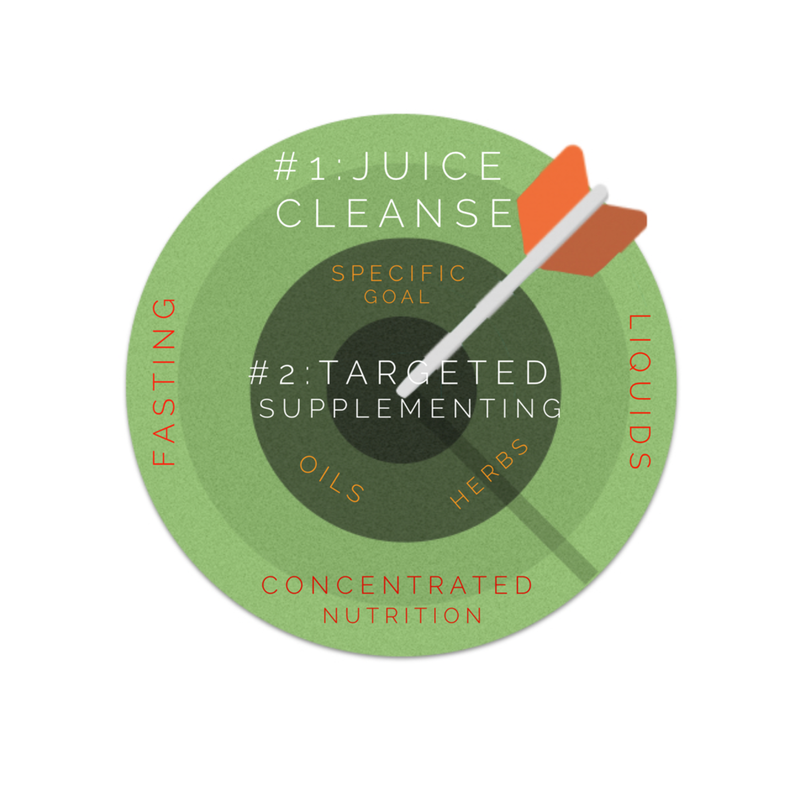 Cleanse Part 2: Which “Targeted Supplements” Cleansing Protocol is Right for Me? Visit this page below for how I did my Digestive Deep-Cleanse with the supplements pictured above, and read more about the 5-Day Cleanse and Slique Weight Loss protocols to see which one fits your health needs! Click the picture below.